Q: I will be visiting Nashville with my kids this summer. What child-friendly activities or attractions would you recommend? A: Nashville is full of fun things to do with kids! Here’s a short list of places kids love to visit in Nashville, from one mom to another. I’ve included links, suggestions, and videos to make planning a fun summer vacation even easier! If you visit Nashville from June to September, make sure your hotel has a pool! Our summers are hot and humid. There’s no better way for kids to unwind than splashing around in an outdoor pool. Staying with family? Hotel pool under construction? Here’s a list of all the fun places to swim in Nashville. I would put Nashville Shores at the top of the kid tourist list. 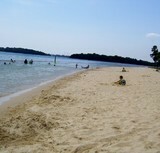 If you prefer to avoid the crowd, check out public beaches at Percy Priest or Old Hickory lakes on the weekdays. Plan an entire morning (plus a picnic lunch) at the Nashville Zoo. It’s a fun place to take visitors of all ages! Do some kid-friendly shoppertainment at Opry Mills Mall and the Opryland Hotel complex. Park free at Opry Mills, and walk to the Opryland Hotel conservatories for a fountain show or boat ride. Hey, it’s air conditioned! Find tons of fun things to do at Bass Pro Shop Outdoor World. Buy a buddy at Build-A-Bear Workshop. Eat in kid-friendly restaurants like the Aquarium or Rainforest Cafe. Take the kids downtown for Nashville history…and fun! Here’s a complete guide to kids activities on 8th Avenue, from tours of the State Capitol to the Adventure Science Center. Free museum alert! The Tennessee State Museum is an air conditioned oasis of local history and cool artifacts. See why everyone loves visiting the Bicentennial Mall downtown!